Eclectus Parrots are fine looking birds with vibrant colored feathers. The two of the most well known subspecies are Vosmaeri and Solomon Island varieties. The Eclectus Parrot is a beautiful bird both physically and temperamentally. 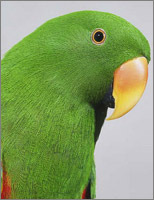 This particular Psittacine family member has been characterized as talkative, chatty, highly animated, curious, affectionate and playful. It is easy to distinguish a male Eclectus Parrot from its female counterpart. 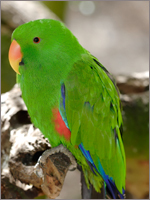 The male Eclectus Parrots are vivid green in color with blue and red splashes on their wings, tails and sides. The males also have bright candy-corn-colored upper mandibles and black lower mandibles. The females on the other hand have red heads and blue to purple breasts, with black beaks. The Eclectus Parrots are natives to the Solomon Islands, New Guinea, northeastern Australia and the Maluku Islands (Moluccas). The Eclectus Parrots are extremely intelligent creatures. Sometimes they train themselves after only one incident of you showing displeasure at being pooped upon. Among all birds in the entire parrot family, Eclectus Parrots rival only the African Grey and the Amazon in their clarity of speech and scope of vocabulary. These highly intelligent birds are very animated and love to participate in daily activities and in doing so, will quickly become acquainted with a daily routine. The Eclectus Parrot can be kept with other parrot species although it is extremely important that any new bird is introduced in the correct fashion. Apart from being beautiful, Eclectus Parrots are intelligent birds. They can rectify their own mistakes by training themselves. Eclectus Parrots are considered among the top three Parrots with vocal ability. They possess clarity of speech as well as a strong list of vocabularies. With minimum training they can imitate words, sentences and even learn songs. However, they are capable of wildness if not trained properly. These intelligent Eclectus Parrots have often been described as "feathered monkeys" when they are absorbed in play. You can well imagine how wild they can be if they are not well trained. The Eclectus Parrots are extraordinary birds and ideally suited as a pet. When taught properly, they are capable of cognitive behavior from a very young age. The ability of the Eclectus Parrot to communicate with humans is a result of their extremely inquisitive nature. When treated in a similarly caring and intelligent way they will quickly learn to communicate properly. The Eclectus Parrot also prefer a calm environment and have a strong ability to notice changes within their normal surroundings. 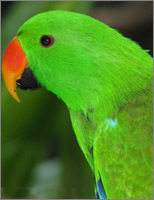 Regular and consistent training form an integral part of the Eclectus Parrot's personality development and with the correct love and attention, this highly intelligent bird makes an excellent pet.